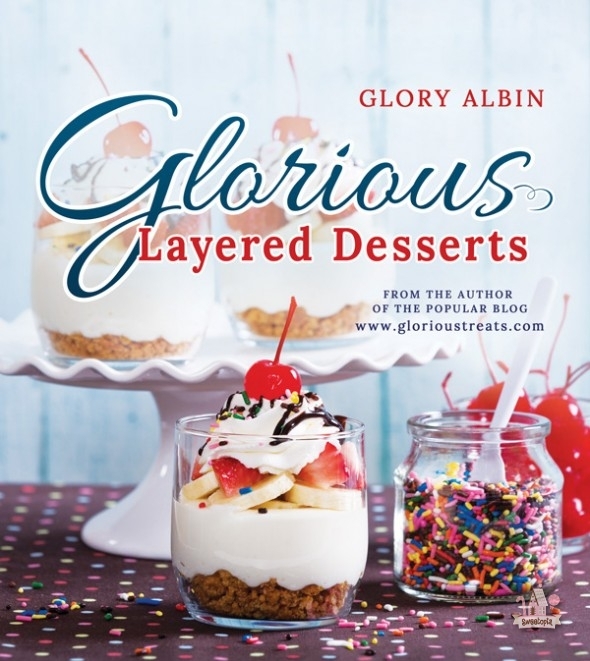 I’ve got a treat for you today – a giveaway for Glory Albin of Glorious Treat’s book, Glorious Layered Desserts! If you haven’t already found Glory on line, you’re going to want to visit her. Not only does she make beautiful layered desserts in jars, she makes gorgeous cookies, cakes, cupcakes and plans stylish theme parties – she’s definitely a talented lady! You can find her blog here and a direct link to a copy of her book here. 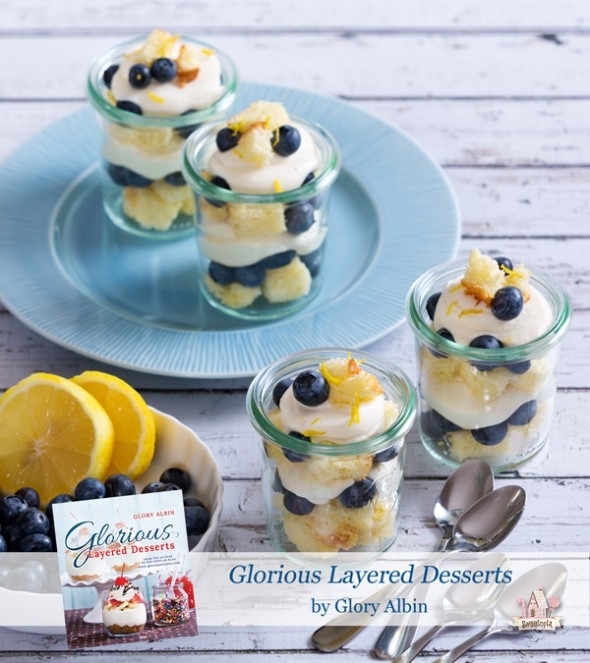 Simply put, Glory’s book is a modern take on traditional layered trifles. Instead of being presented in one large dish, her desserts are designed to be served as beautiful individual desserts. Glorious Layered Desserts is full of creative and mouthwatering combinations such as Caramel Apple Cheesecake, Banana & Nutella Cream Dessert and Brownie Strawberry Shortcake! 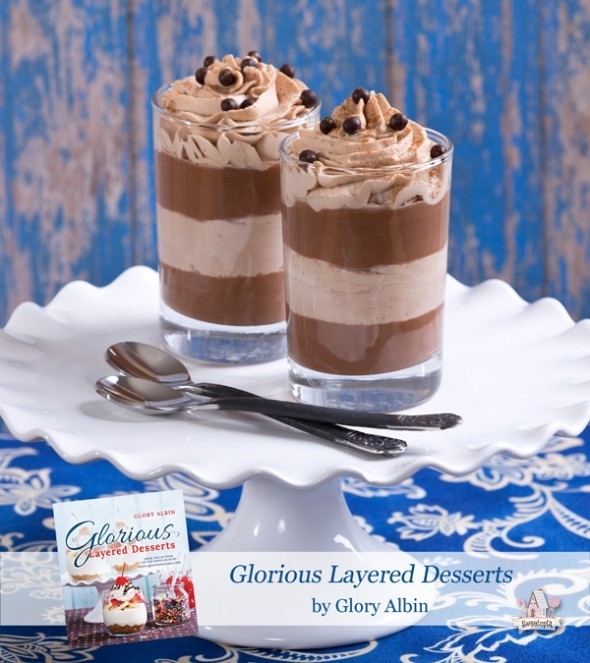 One of the unique features of Glory’s book is that the first half of the book is full of over 35 gorgeous layered desserts, and then the second half of the book is filled with the individual recipes for each dessert component. These recipes can be mixed and matched in countless ways! With each recipe there are ideas for alterations, and also suggestions for easy “store bought swaps” to make things even quicker. And something I also really enjoy, for each finished dessert an individual recipe is shown in a full page photo. I’m so happy to have this book in my “sweet” library and am thrilled to have a chance to host a giveaway for a copy for you! Thanks to all who entered! The winner was comment #119, Gigi! Congratulations and enjoy baking Gigi! Enter to win a signed copy of Glory’s new book; I’ll be giving away 1 copy to 1 winner! The giveaway is for residents of the United States and Canada. The winner will be chosen randomly at random.org. The contest closes at 7pm EST on Sunday, November 9th, 2014. Would love this book. How delightful. Nice lady I meet her at Cookie Con, I would love her book, thank you for a chance to win Marian! would love to win this delicious fun looking cookbook! It would be lovely to win!! I would lovee to win! !